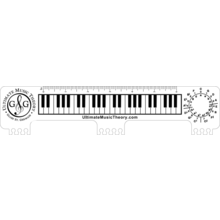 Teacher Exam Pack includes Set 1 & Set 2 for Preparatory, Basic, Intermediate & Advanced Rudiments (Four Exams in each set) = Music Theory Exam Success! Teacher Exam Pack has been added successfully to your wishlist. 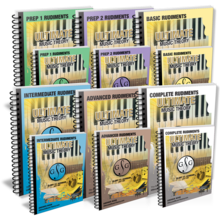 The Ultimate Music Theory Exam Series is the ONLY Exam Series with matching Answer Books. Get them ALL in the Teacher Exam Pack. The Teacher Exam Pack includes Set 1 & Set 2 for Preparatory, Basic, Intermediate & Advanced Rudiments (8 exam books & 8 answer books). The Exam Series Workbook is a convenient 9 X 12 size. ACCUMULATIVE - Complete all 8 exams - The Way to Score Success! The Exam Series Answer Book is a convenient 5 X 7 size. The Ultimate Music Theory Exam Series helps students prepare for nationally recognized music theory exams including the Royal Conservatory of Music Theory Examinations. Large & Small Whiteboards Kit has been added successfully to your wishlist. Ultimate Teacher Pack has been added successfully to your wishlist. UMT Ruler has been added successfully to your wishlist.